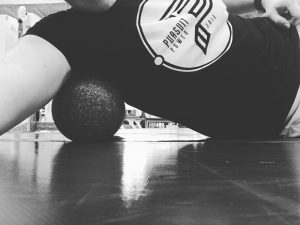 Hey MF-er, are you mobilizing and foam rolling? Mobility and myofascial release are two things commonly left out of everyone’s exercise routine. We are more concerned about the workout itself and less worried about the prep and recovery. Overlooking this process can take a toll on our bodies as well as our workouts. Preparation and recovery are two essential parts of a workout regimen. Preparation is precisely what it sounds like; you are preparing your body to do work. Literally and figuratively. Proper warm-up routines allow the body to anticipate the tasks and stresses it will be undergoing. Recovery: the second slice of bread in this workout sandwich. Without it, you would have an opened face sandwich, and let’s be real, we all want that second piece of bread. By allowing your body to recover by giving it some extra attention, you are going to facilitate performance at or near its highest capacity. In both these components of an exercise program, two specific techniques can be utilized: Myofascial release and dynamic stretching. Myofascial release is a fancy word for self-massage or foam rolling. Dynamic stretching is a form of stretching where the individual actively goes through the range of motion for a joint, multiple times (e.g., a toe touch, to a squat, to a stand). I am a proprietor of a combination of both as the best way to warm up and recover. Our muscles are surrounded by a connective tissue called fascia. This fascia creates a protective sheath around every muscle in our body. The inside our muscles have small fibers called myofibrils that contain the contractile elements of our muscle. Each myofibril is encased in fascia. Fascia, just like the other connective tissues come stiff and can thicken following repeated stress (e.g., exercise). Using a foam roller, you can break out down, loosen and release the tense fascia. There has been mixed research on the perceived benefits of foam rolling on performance, but benefits have been observed. Overall, there have been improvements seen in flexibility, the range of motion at the joint, and decrease perceived delayed onset muscle soreness (DOMS) . In some instances, it has even been proven to increase vascular function. . Imagine that, 10-15 minutes before or after your workout and you are less sore, you can touch your toes and your blood pressure is a little bit better. That may be an exaggeration, but you get a general idea. Giving your muscles a little TLC (literally, you don’t want to foam roll too hard, people will question your bruises) can have improvements on your life in and out of the gym. Now combine that with a good dynamic warm up, and you my friend are going to have one hell of a workout. What do you think of when I say stretching? Standing and attempting you touch your toes? That awful sprinter-ish lunge your coach made you sit in for 30 seconds before you before a squat day? Both are forms of stretching, which has various types but we are going to talk about the dynamic. Dynamic is stretching that involves moving through a joint’s range of motion. This movement can be paired with a minimal hold, but overly your are stretching the muscle running through the movement. Think of those really awesome inchworms I made you do. You are actively elongating your hamstrings as you walk your toes towards your hands. Psoas, Quadriceps, Adductors/Abductors: You have a lot of muscles in your legs, make sure you hit them all. Start at your hip crease rolling down to your knee. Make sure you get the inside (groin) and outside too! Chest/Biceps: Yes, you can do this. Start with the roller at an angle and your arm out to the side, like you are making a half T. Roll from your pec (chest) to your elbow. Lower Back/Midback (end of rib cage to just above your tush): a glute bridge position helps with getting a better amount of pressure. Try this out and let me know how you’re feeling. 1)Cheatham, S. W., Kolber, M. J., Cain, M., & Lee, M. (2015). THE EFFECTS OF SELF‐MYOFASCIAL RELEASE USING A FOAM ROLL OR ROLLER MASSAGER ON JOINT RANGE OF MOTION, MUSCLE RECOVERY, AND PERFORMANCE: A SYSTEMATIC REVIEW. International Journal of Sports Physical Therapy, 10(6), 827–838. 2)Okamoto, T., Masuhara, M., & Ikuta, K. (2014). Acute effects of self-myofascial release using a foam roller on arterial function. The Journal of Strength & Conditioning Research, 28(1), 69-73. 3) Chaouachi, A., Castagna, C., Chtara, M., Brughelli, M., Turki, O., Galy, O., … & Behm, D. G. (2010). Effect of warm-ups involving static or dynamic stretching on agility, sprinting, and jumping performance in trained individuals. The Journal of Strength & Conditioning Research, 24(8), 2001-2011. 4) Richman, E. D., Tyo, B. M., & Nicks, C. R. (2018). Combined Effects of Self-Myofascial Release and Dynamic Stretching on Range of Motion, Jump, Sprint, and Agility Performance. Journal of strength and conditioning research.